Available from Daken , 2300 Bobcat utility vehicles are versatile and ideally suited to farm applications. These four wheel drive utility vehicles also feature a front attachment arm that can be equipped with a number of attachments. The RapidLink attachment system means that the 2300 utility vehicle is capable of moving palletised items, as well as mow, sweep and even clear snow. 2300 Bobcat utility vehicles feature the IntelliTrak Drive System, ensuring excellent traction in tough environments, and the frame is manufactured from rust-free aluminium. Easy to maintain, these fart utility vehicles also feature double arm front suspension and swing Arm Rear Suspension. 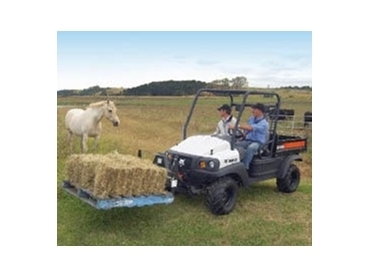 For added operator comfort these farm utility vehicles have an adjustable driver’s seat, tilt steering column and additional leg room. Extra cabin storage and generous cargo area and capacity are also featured.